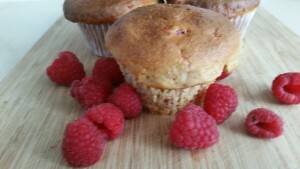 Try these delicious Raspberry Muffins for breakfast or for after dinner. 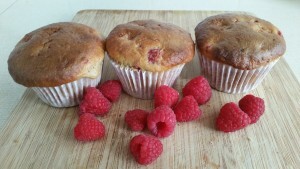 A great recipe that produces moist sweet muffins that jam packed with fresh raspberries. The first step to making these delicious raspberry muffins is to combine all your dry ingredients, flour, baking powder, salt and cinnamon in a large mixing bowl. Mix all the ingredients together until nicely combined. In a separate medium bowl add eggs, granulated sugar, brown sugar, vanilla extract and butter or coconut oil along with the milk and whisk together. Mixture should be yellow in colour. Fold both the wet and dry ingredients together with a wooden spoon. Make sure all ingredients are combined. 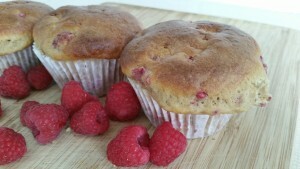 The final step for making these fresh Raspberry muffins is to add the your fresh Raspberries to the mixture and combine. Add the Raspberry muffin mixture to your muffin cases spooning equal amounts into the cases. To make your Raspberry muffins extra sweet, top with sugar before baking. 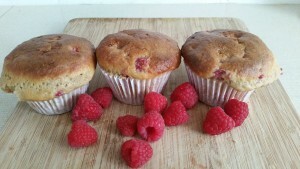 Bake the Raspberry muffins at 200c for around 20 minutes. 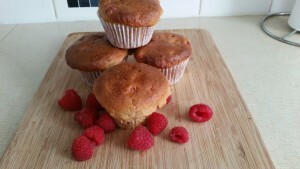 Raspberry muffins should be spongy on top and golden brown. 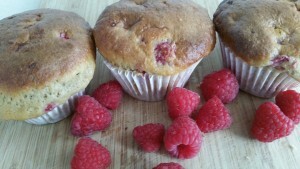 Try these Raspberry muffins straight from the oven warm. Tips: Add Blueberries for Blueberry muffins.